Feeding horses with respiratory issues can be tricky, whether the horse has a cough, a running nose, or a diagnosed condition like COPD (chronic obstructive pulmonary disease) or RAO (recurrent airway obstruction). In all cases, looking to support the horse’s respiratory system is a good call. Actually, even if your horse has a healthy respiratory system, thinking about what you feed to help maintain this is a good idea. It could prevent issues, illness, vet bills and stress moving forward. If you have a horse with a respiratory condition like RAO or COPD, it’s always best to follow veterinary advice, as this is more than just a cough or a cold. This disease impacts on the horse’s breathing and can limit performance and wellbeing. In some cases, drugs might be prescribed to support recovery or maintain the respiratory system at a certain level. The chances are that the suggestions below will also be valuable and could vastly improve your horse’s condition, but always check with your vet. How to feed a horse with respiratory issues starts at how their feed is presented. When horses feed from the floor, whether this is hay, haylage, or hard feed, it encourages natural respiratory drainage. 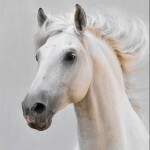 In addition, it can prevent the horse inhaling dust, just because of how he takes the feed. Hay is an area to look at. Many horses with respiratory issues have soaked or steamed hay, to reduce dust. Soaking can reduce the nutritional content of hay, so many people opt for steaming, although a more expensive set up is needed to do this properly and safely. Alternatively, haylage might be an option, as could other alternatives such as chaffs, sugar beet and shorter forage products that can be dampened before feeding. Of course, these are likely to be more expensive too. In all cases, whether the horse has a respiratory condition or not, dust and mould free feed is a must have. All feed should be dampened down before feeding to help support digestion and repress dust, but this shouldn’t be to disguise poor quality products. Some feeds are dustier than others due to the production process so, if your horse has a respiratory condition, it’s worth speaking to feed manufacturers to get the best feed for your horse. Of course, supplements that support the respiratory system can also play a part and, alongside correct management, can help to maintain delicate systems. Herbs are very popular additions for day to day maintenance, but liquids are also available to support respiratory function when challenged. We have an extensive collection here. If your horse has a serious cough and you’ve noticed a decrease in his performance, calling the vet is a good idea – even just to ask for advice – as the respiratory system is delicate and can be easily damaged.